As we grow into adulthood, we become aware of certain universal truths – all living things must die, everyone will experience loss at some point in their life, etc. But just as undeniable, but slightly less cited is the following truth: There are few things that can rouse blinding hatred like a Smurf. And as a child, I was able to witness this first hand each time the 80s cartoon came on TV. Without getting into too much detail, we were a house divided with young Smalerie solidly in the pro-Smurf camp. Even as an adult, I can't hate them. They were one of my earliest introductions to fantasy as a genre, and The Smurfs and The Magic Flute was the first film I remember seeing in the theaters. So when Papercutz generously sent us a copy of their Smurfs Anthology (Volume One), I was the natural Comicazi Lady of Choice. While reading this and making my notes for this review, I was tempted to rouse Little Smalerie again, but she is currently sleeping under the coffee table while watching Strawberry Shortcake in Big Apple City and I'd hate to bother her. So here we go, a totally mature and grown-up review of the Smurfs where I don't even suggest once that you replace the word "smurf" with obscenities for your own amusement. The Book Itself: I can't begin this review without taking a moment to point what a high quality book this is. It's well bound, hardcover with no pesky dust jacket, and has a nice, clean, modern design. For any Smurf fan, it is more than worthy of precious bookcase space and tough enough to withstand multiple readings by you or younger members of the family. Even the pages are nice and glossy without showing every single fingerprint. Anthology Extras: Between each volume collected in the book, you will find a short introduction by Matt. Murray. And yes, he does use a period after his first name, so be gentle my eagle-eyed editors. The world's most famous (and only?) Smurfologist, he provides some brief cultural context to the stories without becoming heavy-handed or diving too deep for an average Smurf fan. Murray even takes an opportunity to address the infamous Black Smurf story line. Taking a cue from the Hanna Barbera cartoon years earlier, Papercutz changed the color of the black Smurf to avoid any racial controversy. 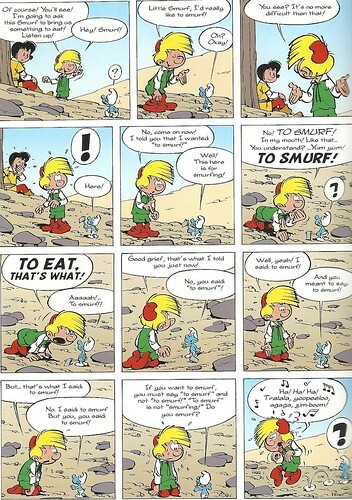 Murray explains Peyo's use of this coloring by stating that in Europe the use of black as a color for the diseased, almost zombie-like Smurf in the story would have been seen more as a reference to the Bubonic plague, since the color wouldn't be connected with race until the Smurfs made it overseas. I'm not entirely convinced of this myself considering that Peyo would have been familiar with the Swarte Piet (or Black Peter), a controversial assistant to the Dutch/Belgian version of Santa Claus. However, Murray's take would also work within the story-line, leaving the final decision up to the reader. The stories themselves: I found myself quite surprised by these stories. Growing up with the 80s cartoon and Smurf books that were actually story books from the show, I was surprised by some of the humor. 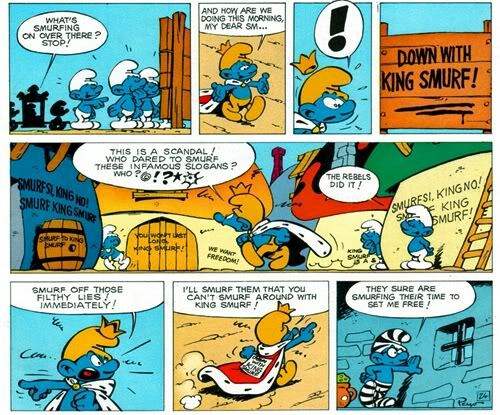 Since the Smurfs volumes are presented chronologically, there are actually running gags that keep popping up. Also, the Smurfs are not depicted as sweet or as annoying as I remember them to be. They are at times cheeky, selfish, and kinda prone to anger and the occasional trick. That's not to say that I enjoyed every moment of this book, however. Peyo can sometimes get caught up in his own storytelling, repeating the same details over and over again in case we don't remember it from the page before. While at times it is part of a gag, other times it just makes the story drag. 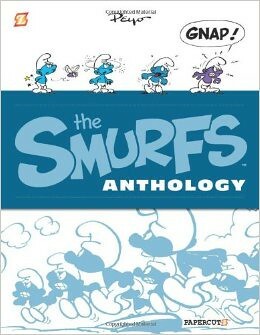 What is also great about this volume is that it not only has the Purple/Black Smurf story, but is also contains "King Smurf", which is considered by many to be the best story that Peyo wrote for the Smurfs. A commentary on how power ultimately corrupts, Murray once again does an excellent job introducing this story framed within the context of European history and the second World War. The plot is simple enough for a morality lesson for the kids reading it, while also serving as an eerie reminder to adults that in many ways this isn't a complete work of fiction. Extra bonus: I openly admit that I was thrilled to find that The Smurfs and the Magic Flute is included at the end of this anthology. I had only recently discovered that The Smurfs were a spin-off of Johan and Peewit (pronounced Peewee). Taking into account that the episodes of the cartoon that included them were always my favorites, I kinda always stood by them as characters when I began to outgrow the Smurfs themselves. Also, the gag where Peewit tries to speak Smurf to Papa Smurf and ends up insulting him to his very core is kinda adorable, especially when the normally serene Papa Smurf has a fit over it. Conclusion: I think this is a great, solid collection for any Smurf fan, but i'm not convinced that it will convert any non-fans into the fold. The stories can still feel too dated or cutesy for some. But for those of us already leaning in the pro-Smurf direction, reading this volume can, at the very least, be an enjoyable walk down memory lane. FTC Full Disclosure: I received a free copy of this book from Papercutz. I was not compensated with money or flutes (magic or otherwise) to write this review. Here's your to let us know how you feel about these smurfy little blue guys. Take the poll below and feel free to voice your opinion (as strong as it may be) in the comments below. Let the debate begin! The Red Menace Tells You What to Read Next!